Located at the Physiotherapy Pedagogical Clinics Building, is named Ricardo Reis Library (BRR) since August 2012, following the regrouping of the UFP’s libraries. Offers open access to shelves and is organized according to the Universal Decimal Classification (UDC). Serves the UFP academic community, as well as any interested user. 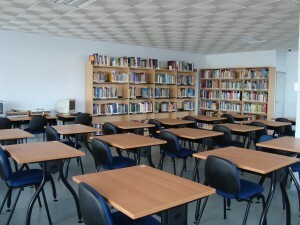 This library has a reading room with seating for 54 people, 8 group study offices (with capacity for 70 people), intended exclusively for UFP’s students and employees. It has lockers, printing, photocopying and scanning equipment in self-service system and wireless connection. Receba as novidades e eventos da Biblioteca UFP.